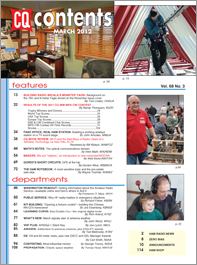 The March issue of CQ introduces a new column, "Makers," written by Matt Stultz, KB3TAN. "Makers" are people who enjoy designing, building, modifying and repairing things. Yes, we also thought the name for those people was "hams," but there are a growing number of non-ham "makers" out there and it's the goal of this column to bring "us" and "them" closer together. Speaking of making things, our lead feature for March is the story behind the story of designing and building the monster beams you may remember from last November's Technology Special -- the 80- and 160-meter Yagis atop the 300-foot tower at OH8X in northern Finland. Radio Arcala team member Toni Linden, OH2UA, takes us "up the tower." 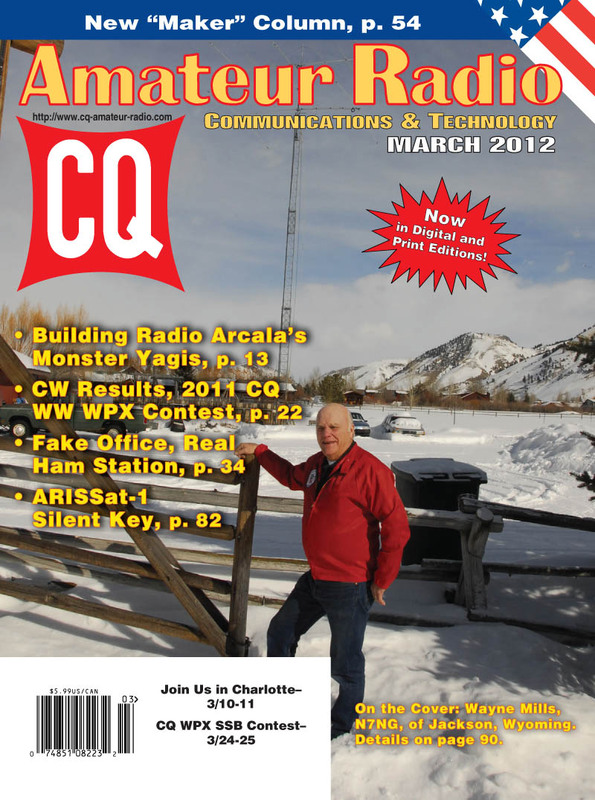 Next, we have the CW results of the 2011 CQ World Wide WPX Contest, which was plagued by solar flares that degraded propagation soon after the contest began. World top scorers for 2011 included a repeat for EF8M (Single Op, All Band, op RD3A), a repeat for P49Y (SOAB-Low Power, op AE6Y), HK1X (Single Op, Single Band), NP2/OL5Y (SOSB-Low, op OK1FUA at KV4FZ), UU2CW (QRP), TO8A (Single Op Assisted, op R5GA), CQ3A (Multi Op, Single Transmitter), CR3L (Multi-Two), and LZ9W (Multi-Multi). Moving from fact to fiction (sort of), "Last Man Standing" TV show producer John Amodeo, NN6JA, tells us the story of setting up a working ham station on the set of the ABC-TV comedy, in "Fake Office, Real Ham Station." And back to real life, Bill Klykylo, WA8FOZ, reviews the new book, Wi-Fi and the Bad Boys of Radio: Dawn of a Wireless Technology, by Alex Hills, AL7K. Alex is one of the "fathers" of Wi-Fi and Bill says his book should be of interest to any ham. Among our columns this month, "Math's Notes" editor Irwin Math, WA2NDM, looks (literally) into "The Optical Communications Domain;" while "Washington Readout" editor Fred Maia, W5YI, covers the information about ham radio that's available on the FCC's website (more than most people think, he says); and Public Service Editor Richard Fisher, KI6SN, explains "Why HF Really Matters in Emergency Situations." Makers Editor Matt Stultz, KB3TAN, debuts his column by explaining that "We Are Makers," while Kit-building Editor Joe Eisenberg, K0NEB, "opens a fortune cookie" and describes how to build (make) the new KN-Q7A transceiver kit from China; and "Learning Curve" editor Rich Arland, K7SZ, discusses "Sea-Double-You: The Original Digital Mode." Contributing Editor Gordon West, WB6NOA, looks at whether wearing a GPS-equipped handheld on your belt affects its ability to keep track of where you are in his "Gordo's Short Circuits" column; and "Ham Notebook" editor Wayne Yoshida, KH6WZ, gets into the somewhat uncomfortable topic of helping your family decide what to do with your gear once you're no longer with us. New Products Editor John Wood, WV5J, looks at a couple of new antennas (the ice is starting to melt; time to start climbing! ); VHF-Plus Editor Joe Lynch, N6CL, reports on the re-entry and "death" of ARISSat-1; Awards Editor Ted Melinosky, K1BV, makes a few additions and corrections to previous columns and looks at a series of awards that's unusual because it's sponsored by an individual rather than a club or other organization; DX Editor Carl Smith, N4AA, looks ahead to upcoming DXpeditions, forthcoming rules changes on 60 meters, a special award for the 75th anniversary of DXCC, and the nominating process for the QSL Manager of the Year award. Contesting Editor George Tranos, N2GA, asks several hams around the world to tell us about their contesting mentors, and Propagation Editor Tomas Hood, NW7US, reports on "Chaotic Space Weather" as Cycle 24 really kicks into high gear. 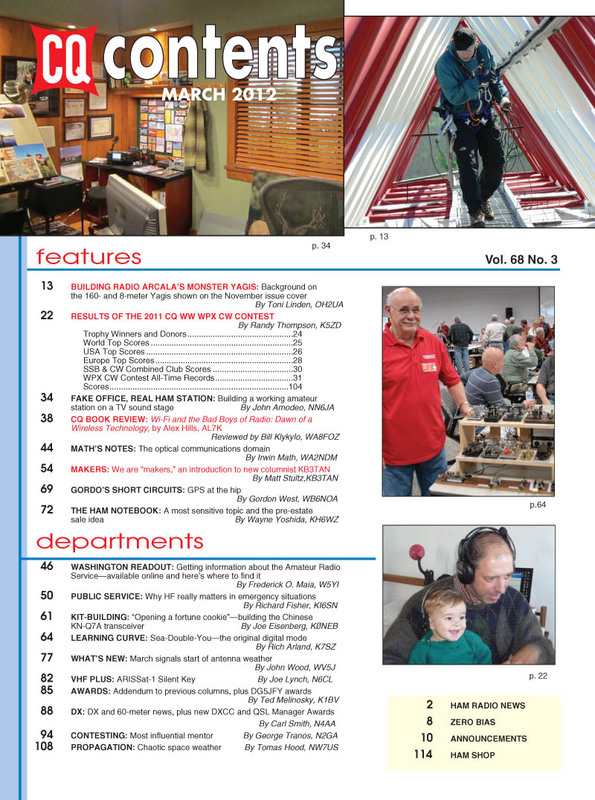 That's a brief look at what's coming up in the March issue of CQ magazine, which should be on newsstands and in subscribers' mailboxes by early March, and available to digital subscribers by March 1. 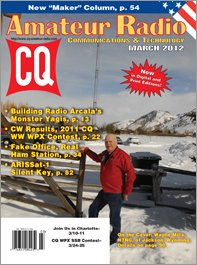 For information on becoming a CQ subscriber - print or digital - Click Here. Next Month: Our first annual QRP (Low-Power) Special!